In December 2017 the Centre for Non-Traditional Security Studies at the S. Rajaratnam School of International Studies (RSIS) identified four policy balances that must be struck when using emerging technologies in humanitarian operations. 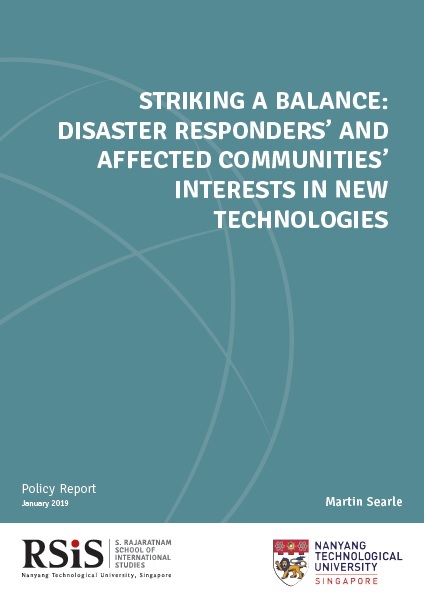 This report specifically explores how to balance the needs of disaster responders with those of the disaster-affected when innovating. It presents three principal findings. First, innovators must do more to confirm if their innovations actually bring benefits. Second, local innovators may be more open to unforeseen uses of their ideas, resulting in more locally beneficial outcomes. Third, start-up companies are uniquely situated to co-innovate productively with local communities; however, this brings additional risks that need mitigating. The paper gives several policy recommendations in light of these findings.